ULI JOHN ROTH is a fine vocalist and a masterful musician; and taking a trip Beyond The Astral Skies is a great way to be 'on the rocks' with this talented artiste as this great album comes on release in the 21st Century. Perhaps better known to some rock fans as Ulrich Roth, Uli John was lead guitarist in German hard rockers The Scorpions from 1974's Fly To The Rainbow through until 1978's double live album Tokyo Tapes. Uli left the Scorpions and released Earthquake in 1979, followed by the 'hot' Firewind two years later on the Brain/Metronome label. 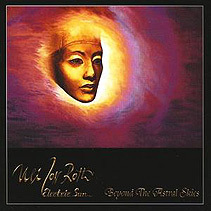 The third and last album to be released under the Electric Sun banner, 1985's Beyond The Astral Skies was recorded between December 1983 and April 1984 and released by EMI in 1985. Electric Sun's first major label release features cover art by the late Monika Danneman, and now includes two bonus edits of the album's dramatic and electrifying lead single The Night The Master Comes and its B-side, The Return  a charming and interesting track that is at one with the elements and very sensual. We also loved the treatment of the unusual Angel Of Peace and the catchy Icebreaker. Eleison and Son Of Sky are notable for their powerful and soaring vocals and a torrent of overwhelming musical excellence and we found Why? cheery and enigmatic. When it came to I'm A River  a most enjoyable track  we came up with melodic rock that has an overlay of folk and a dash of Scottish traditional music. All very good and inspirational to listen to. This is Uli John Roth having the time of his life on the fantastic album Beyond The Astral Skies, creating a universe of glittering, hearty rock tracks to keep you amused.  Uli John Roth's Beyond The Astral Skies is available now, released by EMI. Catalogue Number: 268 8442. 6 Icebreaker | 7 I'm A River | 8 Angel Of Peace | 9 Eleison | 10 Son Of Sky.